After hearing more than enough chatter about ApplePay, not to mention bitcoin (and the crucial distinction between Bitcoin and bit coin) at Money 20/20 last week, it may be time to shift gears to more of focus on the consumer. I’m not targeting the same topics covered by magazines on the payments industry or banking technology. I’m inspired by sites, such as Jason Clampett’s Skift.com that covers travel in a unique way by blends an insiders view (i.e. what people who work in travel biz) with what consumers want to know. OK, so what’s interesting to consumers? Well, although most of the press has covered more recent entrants (ok, one especially big new entrant based in Cupertino) to payments, I think there’s a lot to say about consumers and Venmo. So, what started with students in their early 20’s is shifting to other demographics and usage is evolving from peer-to-peer (“I owe you $20”) to wider retail use in places like Starbucks (see above). Helen Jewitt, who looks at in trends in financial services for Wolf Ollins, a leading brand consultancy, says that “everyone is using Venmo in San Francisco” and making paying by check look like whipping out your BlackBerry 9900. As San Francisco sometimes goes, so goes the Nation? Square and Google Wallet are in many ways ahead from a brand and reach perspective, but Venmo is social and has clearly established itself as one of the services to watch in mobile payments. This isn’t the place to find the latest product reviews, but I recommend the excellent this year’s WSJ review of the category. Note: Square has been catching up this fall with features (such as pay by text, evolving last year’s payment innovation, where you could simply email someone and cc request@square.com to transfer money). What’s telling is after PayPal acquired Braintree last year, instead of rebranding Braintree (or its Venmo product), PayPal continued to use the more credible Braintree brand – especially on billboards targeting developers in the Bay Area. 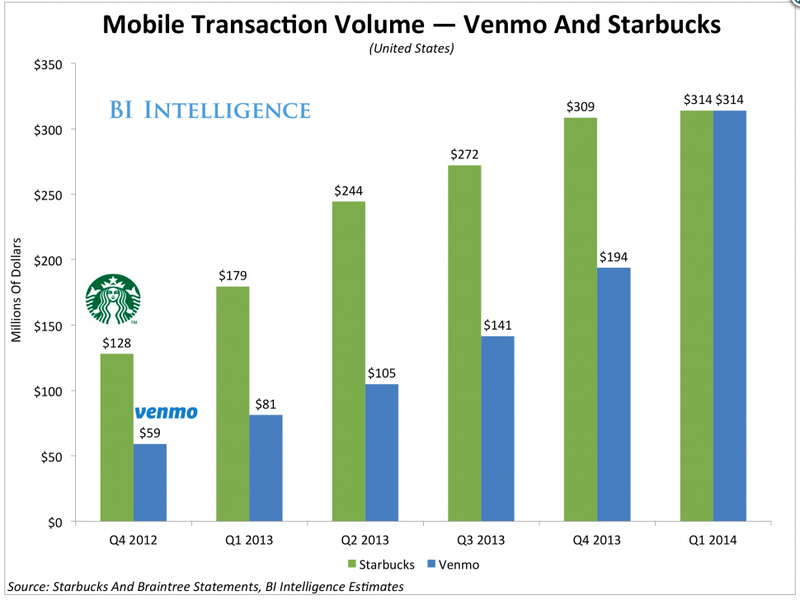 Venmo has been called the ‘killer app’ and has certainly given new life to PayPal, and that’s significant. And for those who don’t follow FinTech closely, PayPal’s been adrift for years. In 2014, of course, PayPal announced its spin out from eBay – after years of saying it was strategic – which led to rumors of acquisition by everyone from Apple to Alibaba, although Reid Hoffman said at the Technonomy event this week that any Alibaba/PayPal tie up is unlikely. From me it said a lot that on day the spin out, Stripe tweeted eBay now had an opportunity to improve its payments…..
There’s much to learn from the likes of Venmo and Stripe – a company I’ll cover in a separate post – but it’s worth listening to Stripe’s co-founder Patrick Collison’s predictions on the future of payments at Techonomy this week. Posted on November 14, 2014 December 18, 2014 by Michael Halloran	This entry was posted in Uncategorized and tagged Braintree, Google Wallet, Square, Venmo. Bookmark the permalink.